The 2016 re-make however just doesn’t seem have the same impact. It has all the cinematic and technological finesse you would expect from a Hollywood blockbuster but director Timur Bekmambetov and writers Keith R. Clarke and John Ridley have seemed to place greater emphasis on aesthetics than actual plot development and dialogue. The directing is haphazard and the editing is frustrating, the only saving grace being Marco Beltrami’s score which although not always consistent at least lends an edge to an otherwise plodding film. Judah Ben-Hur (Jack Huston) and his adopted brother Messala (Tony Kebbell) are inseparable until the realities of allegiance to the Roman Empire come to the fore. 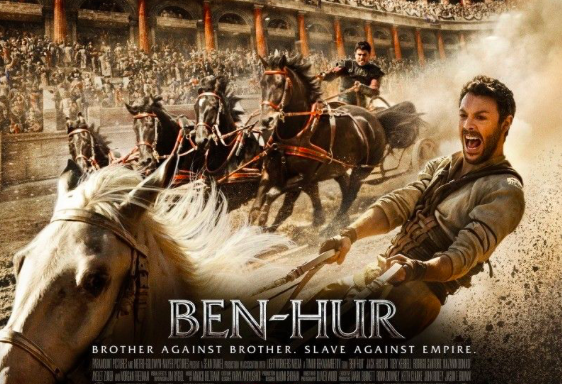 Falsely accused of treachery Ben-Hur is condemned to be a galley slave, his former grand house in Jerusalem left mangled by the soldiers and his mother and sister sent to a leper colony – his wife Esther (Nazanin Boniadi) manages to escape. The backdrop of Jesus the Christ, played by Brazilian Rodrigo Santoro, is supposed to give the character and possibly the film a secular appeal but the language is so wooden that the beatitudes trip of his tongue as little more than glib mutterings. Kebbell does better than Huston. As the adopted brother (different to the original epic in which Messala was his onetime friend) Kebbell plays his character with simmering desire to be more than what his name and forebears suggest and builds upon his legacy for playing villainous characters (remember Dr. Doom in Fantastic Four?) with moderate success. Not so much our lead. Huston comes across as passive and unwieldy delivering clunky lines that could easily that are more inclined to make audiences prince but some rich kid from Malibu who went to Oxbridge. Occasionally it even feels that he would have been better suited to playing Christ, his soft demeanour lacking the raw and blazing heat of a man set upon revenge. Morgan Freeman however is an asset to the film – after all having the man who played God on set must give you at least some brownie points especially if he’s in dreads. Freeman plays the omniscient narrator as well as Ilderim, a sheikh with a perchance for placing winning wagers and is an improvement on wily Arab of the original. It is under his tutelage that Ben-Hur remodels himself to take on his adopted brother and after a decent haircut and shave emerges a brand new man. The chariot as it was in the beginning, is now and forever shall be the highlight of any Ben-Hur epic. Yes, Paramount doesn’t use any CGI and the result is temporarily absorbing but it still lacks the drama and scale of its epic predecessor that was shot on a wide aspect ratio 2.76:1 (in comparison to 1.85:1 or 2.35:1). It’s almost a pity that the film doesn’t end there because the ending is the most saccharine you could ever imagine with the two brothers now re-united and charging into the sunset on horseback. The film has promise and indeed rides upon millennia of promise and devotion, but overshadowed by a lukewarm lead, rough cinematography and little imaginative directing this is far from a cinematic success of biblical proportions.